Alexandria is not the kind of artist who over-sanctifies her own art. She’d rather talk about it with a big smile, in the joyful mess of her studio. Most of all, she’s an artist who loves other artists ; the most important ones, of course ; and as an admirer of Picasso, she confesses she’d love to have dinner with him, if it weren’t too late … As much as the modern ones, that she follows on Instagram. What she loves about them is this special eye they have, that is never the same from one to another. Knowing that an artist’s vision of the world is capable of affecting hers deeply fascinates her. The female body is her main subject ; she feels it close to her art, especially considering that she studied fashion at some point. From these years spent observing clothes and all the theories about them, she remembers the strong feeling that what matters above all is the way clothes evolve on the body, how they exalt and enhance it, how they embrace it. 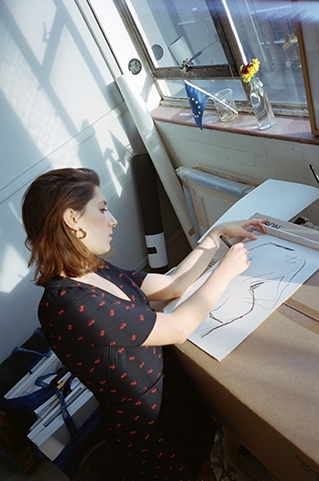 Freeing her drawings of all the pressure that is applied to women bodies nowadays is incredibly close to her heart : “in my drawings, the shapes are free and simple.” When Alexandria takes her pencil, she doesn’t put herself under pressure either. She simply sits in front of a sheet of paper. “Sometimes it works … Sometimes it doesn’t.” She’s the very essence of spontaneous, and “authentic” is a very important word and concept to her. That’s what she values so much in the female body : this authenticity flowing through the curves and the softness. The openness and the attentiveness. 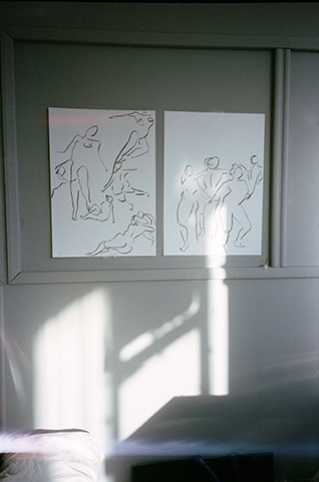 An atmosphere she also finds in the morning, at her studio, when she loves drawing the most. The early London light is ideal for her art and inspiration. It’s true and natural. The importance given to freedom ; that’s the advice she would give to her younger self, first and foremost when it comes to the worth we give to what other people think of you. Evolving for yourself, and just for yourself, is what really matters - she confesses in a whisper that in a way, her paintings picture the person she’d want to be. More quiet, more poised, more confident. "I love this idea of an incomplete and blurred feeling, like an invitation to begin something new."